It’s ironic that a California state agency that claims to be saving the world from climate change and environmental harm continues to pursue strategies to circumvent and evade substantive environmental review of its proposed alignment through the San Joaquin Valley. But the California High-Speed Rail Authority (CaHSRA) has consistently done this as it tries to avoid the costs, delays, and inconveniences other developers endure during the environmental review process. We feel what is good for the goose should be good for the gander. CaHSRA has managed to get primary environmental review of high-speed rail alignments to fall under the federal National Environmental Policy Act (NEPA) and not the more stringent California Environmental Quality Act (CEQA). Now it wants to take authority from the federal government for environmental review decisions. On May 2, 2018, the Federal Railroad Administration (an agency of the U.S. Department of Transportation) invited public comment on an application from the California State Transportation Agency (CalSTA) and California High-Speed Rail Authority (CaHSRA) to participate in the “Surface Transportation Project Delivery Program.” This program would allow the California High-Speed Rail Authority to be responsible for environmental review as the lead agency, rather than the Federal Railroad Administration. Big business and industry groups such as the Silicon Valley Leadership Group, the American Road & Transportation Builders Association, and the US High Speed Rail Association also chimed in with support. Union umbrella groups such as the Transportation Trades Department, AFL-CIO and the State Building & Construction Trades Council of California, AFL-CIO also support the shift of authority. On August 16, 2018, the board of the California High-Speed Rail Authority authorized the CEO of the agency to have certain powers regarding environmental review under the National Environmental Policy Act. As noted in a staff report, the agency plans soon to release the Central Valley Wye Draft Supplemental Environmental Impact (related to the high-speed rail assignment near Merced) and the Fresno-Bakersfield Locally Generated Alternative Final Supplemental Environmental Impact Report/Environmental Impact Statement (related to the high-speed rail alignment into the City of Bakersfield). The goal is to clear the path through the fields of the San Joaquin Valley and the urban cores of Fresno, Hanford, and Bakersfield as soon as possible, without the inconveniences that other developers endure during the environmental review process for proposed projects. Citizens for California High Speed Rail Accountability (CCHSRA) co-chairman Frank Oliveira was interviewed for an investigative news story about another failure of the California High-Speed Rail Authority to fulfill its commitments. KCRA Channel 3 in Sacramento broadcast the story on December 8, 2015. In June 2013, the California High-Speed Rail Authority produced a report for the state legislature as required by Senate Bill 1029, which was signed into law by Governor Brown in 2012. Entitled Contribution of the High-Speed Rail Program to Reducing California’s Greenhouse Gas Emission Levels, this report was supposed to analyze the net impact of the high speed rail system on the state’s greenhouse gas emissions. This report also helped to justify the decision of Governor Brown and the California legislature to keep the project alive through annual budget appropriations derived from Cap-and-Trade auction revenue. Construction of the high-speed rail system was not supposed to contribute to climate change. All pollution would be offset by other activities. Frank Oliviera speaks about the absurdity of the California High-Speed Rail tree-planting program. Frank Oliveira of the group Citizens for California High-Speed Rail Accountability said some studies have shown the state will need to plant 5 million trees. “Where are they going to put 5 million trees and keep them alive? Who’s going to take care of those trees? How much is that going to cost to take care of those trees?” Oliveira said. 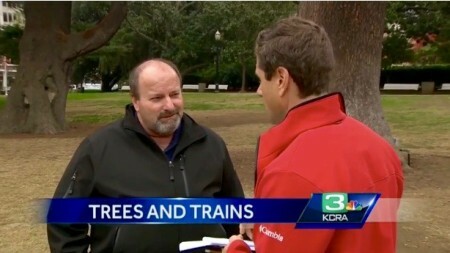 Read the article and see the video here: High-Speed Rail’s Tree-Planting Plan Slow to Start: Nearly a Year After Groundbreaking, Not a Single Tree Planted. Also, see the CCHSRA letter to the California Air Resources Board about the appropriateness of using Cap-and-Trade auction proceeds to fund California High-Speed Rail construction: Questioning the Outlandish Idea That California High-Speed Rail Deserves Cap-and-Trade Funds. An April 2014 article published by the California Policy Center suggested that the tree-planting plan and other “schemes” to achieve zero net emissions were “farcical.” See California High Speed Rail’s Dubious Claims of Environmental Benefits. The California High-Speed Rail Authority is desperate for funds to perpetuate its vision of a $68 billion high-speed passenger train between San Francisco and Los Angeles. The United States Congress and private investors don’t want to give it any money. The San Diego Union-Tribune published an editoral on August 30 (High-Speed Rail Project: Dead Train Walking?) optimistic that the courts will soon bring the boondoggle to an end. Only the most committed supporters of this project (such as Governor Jerry Brown) choose to ignore the Authority’s failure to comply with the requirements of Proposition 1A, the November 2008 ballot measure that authorized $9.95 billion in borrowing to advance design and construction of the high-speed rail system. But those committed supporters have political power. The ongoing convenient solution to the funding shortage is the California legislature’s budget directive to send a few hundred million dollars each year from the proceeds of “Cap-and-Trade” auction revenue (referred to by some as “taxes”) to the High-Speed Rail Authority. That money allows Construction Package No. 1 (civil engineering work between Madera and Fresno) to sputter onward with dreams of a big cash infusion someday. See the CCHSRA letter at Public Comments from Citizens for California High-Speed Rail Accountability: Funding Guidelines for Agencies that Administer California Climate Investments. No state agency that attempts to escape CEQA [California Environmental Quality Act] regulations should ever benefit from Cap and Trade revenues. If HSRA continues down that path, logically the following exigency must be enforced: C&T, a state environmental program, would necessarily have to rescind all funding to the HSR project. Several attempts to soften CEQA regulations or to exempt the HSR project from CEQA have occurred since 2012. At this time, the ARB needs to hold back funding to a project of this magnitude, in favor of remaining in alignment with CEQA regulations, rather than being complicit with HSRA’s efforts to avoid them. See the Cherylyn Smith letter at Public Comments #1 from Cherylyn Smith: Funding Guidelines for Agencies that Administer California Climate Investments and Public Comments #2 from Cherylyn Smith: Funding Guidelines for Agencies that Administer California Climate Investments. Californians across the political spectrum want to see public accountability for California High-Speed Rail. Go to a California High-Speed Rail Authority board meeting, and you’ll see people from all walks of life with a wide variety of concerns about this $68 billion project. Today (Wednesday, August 12, 2015) at 3:00 p.m., attorney Mike Brady will be interviewed on the “Stir It Up” radio show hosted by Richard Gomez on KFCF Free Speech Radio, 88.1 FM in Fresno, California. 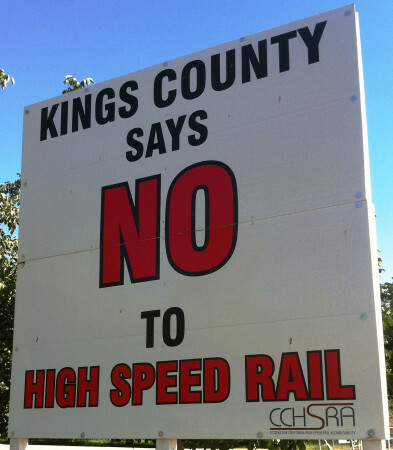 Mr. Brady represents people in Kings County objecting to the conduct of the California High-Speed Rail Authority as it pushes forward with its vision of a bullet train through the farmland of the Central Valley. Also scheduled to be interviewed is Cherylyn Smith, a Fresno teacher and environmental activist. You can also listen to the show at KFCF 88.1FM – Free Speech Radio. The audio will also be available for two weeks following the show. Citizens for California High-Speed Rail Accountability (CCHSRA) is urging the California Air Resources Board (ARB) to develop funding guidelines for Cap-and-Trade auction proceeds that force the California High-Speed Rail Authority to explain its plans for reducing greenhouse gas emissions. ARB is in a public comment period in the development of final guidelines for this massive spending program. CCHSRA has now submitted eleven recommendations to the Air Resources Board for guidelines that will allow the public to get specifics about how the bullet train will reduce emissions that cause global climate change. Fukuda believes the High-Speed Rail Authority is making up promises about greenhouse gas reductions to get desperately needed money. “The Cap-and-Trade program is a convenient source of money for a project that has strayed badly from what was presented to voters as Proposition 1A in 2008,” he says. Today (July 2, 2015) the federal Surface Transportation Board rejected a request from the Peninsula Corridor Joint Powers Board meant to exempt the proposed Caltrain Electrification project from the California Environmental Quality Act (CEQA). The Caltrain governing board wanted the Surface Transportation Board to declare that the proposed Caltrain Electrification project is a matter of interstate commerce and therefore covered under federal and NOT state environmental review. The California High-Speed Rail Authority has a vision that one day its high-speed trains will share track with Caltrain between San Francisco and San Jose. This is the northern “bookend” in the current California High-Speed Rail Authority Business Plan. Electrification of Caltrain is a step toward achieving that vision. It is even receiving funding from Proposition 1A. 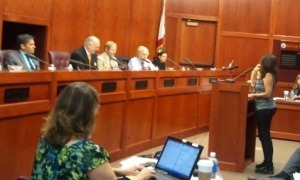 On May 19, 2015, the Peninsula Corridor Joint Powers Board petitioned the Surface Transportation Board to do what the California High-Speed Rail Authority has successfully done twice: get an exemption from the California Environmental Quality Act (CEQA) so that it doesn’t have to deal with litigation challenging the adequacy of the approved Final Environmental Impact Report. The Surface Transportation Board didn’t buy the argument that Caltrain commuters were engaging in interstate commerce. In February 2015, the Town of Atherton, the Community Coalition on High-Speed Rail (CC-HSR) and the Transportation Solutions Defense and Education Fund (TRANSDEF), known as the “Atherton Parties,” filed a lawsuit contending the environmental review under CEQA for Caltrain electrification was insufficient. This lawsuit will continue now that the Surface Transportation Board has denied the Caltrain petition. Joining the Atherton Parties to argue against CEQA exemption was the Alliance for a Cleaner Tomorrow (ACT), which alleged that agencies such as the California High-Speed Rail Authority and Caltrain seek special CEQA exemptions after those agencies commit to a Project Labor Agreement with trade unions for construction.